Foreign money has been flooding NYC real estate. Now, some of it will be controlled by equity-focused developers. NYC-based Asian Americans for Equality (AAFE) recently established an EB-5 regional center, which can accept investments from foreign investors in exchange for permanent U.S. residency. (Such investors receive “EB-5 visas.”) By all available accounts, it is the first EB-5 regional center established by a nonprofit community development organization. If everything works out as planned, CDCs and nonprofit developers in the NYC metro region from New Jersey to New York to Connecticut will be able to work with AAFE to package and offer EB-5 investment projects to foreign investors. AAFE hopes to do three to five deals in the next few years. Firsts are nothing new for AAFE, the worker and tenants rights organization-turned community development corporation (CDC). Its first real estate project was the first affordable housing project in NYC to take advantage of Low Income Housing Tax Credits (LIHTCs). “We’ve been using LIHTCs, recently the last few years using New Markets Tax Credits. But still there’s a gap for a lot of community development organizations,” says Chris Kui, executive director at AAFE. Congress created the EB-5 program in 1990 to spur job creation. Investors must make a minimum $1 million investment into a commercial enterprise, or $500,000 minimum if that enterprise is located in a “targeted employment area” (defined loosely as an area with higher than average unemployment). Investors (and some family members) gain conditional U.S. residency upon making the investment. If the project is proven by a third-party analysis to have created at least 10 jobs within five years, they gain permanent residency. Few foreign investors bit on the program initially. In 1992, Congress instituted the regional centers program, allowing certified for-profit entities to seek out foreign investors and pool their investments into deals that were pre-verified by a third-party analysis to have the potential to create the requisite number of jobs. Still, the program remained sparsely used. 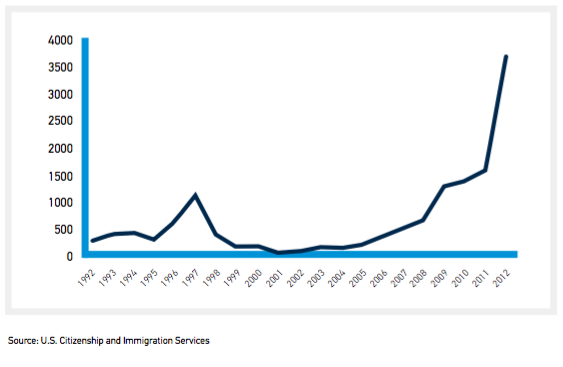 From 1990 to 2008, EB-5 residency approvals topped a thousand in one year only once. Strapped for cash due to the 2008 mortgage crisis and ensuing Great Recession, real estate developers “discovered” the EB-5 program. Shawn Escoffery remembers the moment vividly. “You saw commercial development start to pick up. I was wondering what happened. Lo and behold, the private market found an underused program that brought in foreign capital into these investments,” says Escoffery, program director for strong local economies at the Surdna Foundation (which provides financial support to Next City). Escoffery was living in Brooklyn at the time, leading him to look into the redevelopment of the Atlantic Yards, including Barclays Center arena, completed in 2010. That project utilized $475 million in EB-5 money. Other notable EB-5 financing includes the massive Hudson Yards redevelopment in Manhattan. That project famously owns the title of largest pooled EB-5 investment to date, $600 million from 1,200 Chinese families. The EB-5 program hit its cap of 10,000 residency approvals for the first time in 2014, and did so again last year. In 2015, EB-5 investments brought in a grand total of $4.9 billion. For context, just 5 percent of that (about $250 million) would be more than the entire budget of the CDFI Fund ($233.5 million), an arm of the U.S. Treasury that has become essential to community development finance. EB-5 investments rarely finance entire projects themselves, but they can provide crucial gap financing at the right time. Private developers also like the EB-5 program because the capital comes cheaper than most other sources, given that the primary investor incentive is to obtain U.S. residency. Each regional center decides what rate of return they need to pay to attract enough investors for a given project. AAFE plans to pay between 1 and 2 percent. As you might expect, fraud has been an issue. There have been instances of ghost projects with no real plan to do any actual development or construction or job creation, defrauding investors of their money. It’s also possible to fudge the definition of “targeted employment area.” States define targeted employment areas, so for example New York real estate developers can lobby to designate all of NYC as a targeted employment area, giving them the opportunity to court smaller investors into the Hudson Yards project despite its posh location. There’s also little accountability for the kinds of jobs created, nor for whether the jobs go to people from a community that’s actually suffering from high unemployment. Bringing the EB-5 program at least partially back to its original intent is a big reason why the Surdna Foundation and Garfield Foundation both provided financial support to AAFE to get its regional center approved and provide some working capital to begin assembling EB-5 deals. “When you survey the places EB-5 was being utilized, it was not being utilized in the places where it was intended,” says Orson Watson, program adviser for community revitalization at Garfield. Surdna and Garfield funded a 2014 study on the EB-5 program’s potential for impact on urban revitalization, authored by the Initiative for a Competitive Inner City. “The AAFE EB-5 regional center is really an application of the research,” Watson adds. The trio of organizations hope that foreign investors will be especially interested to support mission-based projects with community input, vetted and packaged by a community-based organization with deep roots in social justice and community activism. There’s also the social, family and cultural ties. AAFE, while it works all over the city and not just with the Asian-American community, still has its headquarters in Chinatown and core base of support in NYC’s massive regional Chinese-American community. Meanwhile, out of 9,764 EB-5 conditional residencies approved in 2015, 8,156 went to investors and family members from China. One of the first projects slated for AAFE’s EB-5 regional center: the Ocean Bay CDC plan to revitalize a blighted corner of the Rockaways, an oceanside Queens community. AAFE hopes to raise $5 million in EB-5 money for the $10 million project.